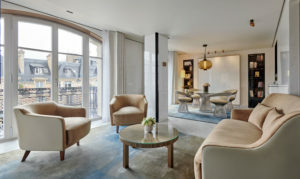 Lutetia, a hotel of The Set, on the Left Bank in Paris, has unveiled a new collection of signature suites. These suites both reflect the sensibility and ethos of their Left Bank location in their design and allow their guests to gaze upon it from their myriad balconies and terraces. Designed by architect Jean-Michel Wilmotte, each of the signature suites is different in character but all evoke a residential style that is both modern and grand. As its name suggests, this suite commands singular views of the city’s iconic tower from its vantage point at the pinnacle of the hotel. This more than 600-sq.-ft. suite located on the 6th floor spans two levels. The first floor comprises a master bedroom with its own private terrace and bathroom in Carrara marble. 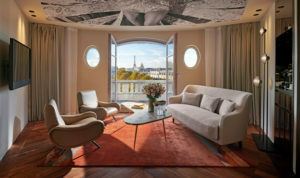 The suite’s piece de resistance is to be found on the second level, a staircase ascends to a stylish sitting room complete with artwork and luxurious bespoke furniture and outside a century-old art nouveau grotto, directly facing the Eiffel Tower. This elaborately carved, intimate terrace forms a key part of the hotel’s iconic façade, unique amongst Paris’s hotels and can be rightfully described as one of the city’s most romantic locations, as befits the suite’s name. Imagined as a sanctuary for writers in the most artistic of cities, this nearly 650-sq.-ft. suite located on the 6th floor is inspired by the hotel’s illustrious literary past. 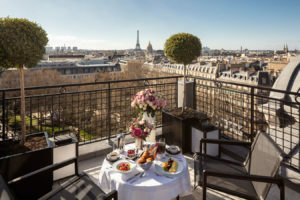 A collection of more than 200 books will entertain those who wish to cloister and pay homage to past guests such as James Joyce and Jean-Paul Sartre, while stunning views of the Eiffel Tower will delight all others. Fitted throughout in golden oak, the suite is filled with light and its large balconied living room, library and writing area, spacious bedroom and marble bathroom offer the feel of the chicest of St. Germain apartments. 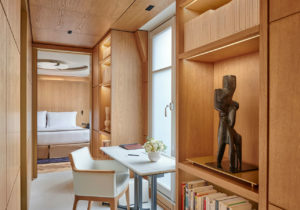 Featuring bespoke furniture designed by Jean-Michel Wilmotte, as well as individual artworks designed to stimulate the literary imagination, this suite offers a truly ‘Left Bank’ experience that is both elegant and inspiring. A second bedroom can be conveniently connected to offer a two-bedroom suite. Sophisticated but never gauche, this 785-sq.-ft. suite, located on the 6th floor, reveals itself as one of the most glamourous in the hotel, inspired as it is by the city’s legendary reputation for fashion. With a 215-sq.-ft. terrace that seats four guests, separate living and dining areas and a guest bathroom, the suite is as ideal for intimate gatherings as it is for an inspiring private stay in the city that dominates the world of couture. Styled to be both romantic and urbane, the suite is light and airy throughout, with silver and gold accents alongside unique items from Parisian couture houses. The Macassar wood alcove and bronze detailing in the living space adds to the suite’s elegance, while the iconic Walter Knoll table and chairs emphasizes its design credentials. A large dressing room and marble bathroom surround the bedroom creating a quiet and peaceful atmosphere perfectly juxtaposed to the vibrant entertaining spaces. Created in homage to an artistic icon of the Left Bank and the Jazz Age, this more than 800-sq.-ft. suite, located on the 5th floor, offers breathtaking views over Paris and its Eiffel Tower from all of its expansive windows and terrace. The vibrant presence of the suite’s namesake Josephine Baker is present in a bespoke piece of photographic art that enlivens the living room ceiling and overlooks a pair of classic Marco Zanuzo armchairs. A wide sofa also in the living room is positioned to perfectly admire the iconic Eiffel Tower and outside, the spacious terrace holds a table and two chairs that allow for the most romantic and memorable moments. Inside, and throughout the suite, smoked larch wood is used, bringing an elegance and warmth to the generously proportioned spaces. The bedroom is decorated in soothing tones and has a marble bathroom flooded with light and two French windows, while a guest WC and large walk-in wardrobe completes the suite. 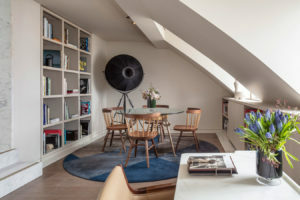 Created in homage to the area that many consider the true soul of Paris, the Saint Germain Penthouse honors the neighborhood that the city’s most celebrated artists have called home. On the first level, a generous living room extends onto a furnished terrace with the opulent bedroom next door complete with master bathroom in Carrara marble. The architect’s distinct hand can be felt at work throughout with bespoke lighting and furniture throughout. At the very center of this Parisian penthouse, a winding stair leads to a lavish rooftop retreat—a terrace with 360-degree cinematic views of the city. As suited to a glamourous reception or party as it is a luxurious breakfast or romantic meal, the terrace completes this unique suite. Grand in scale, the Penthouse comprises seven unique rooms over more than 1,000 sq. ft., each competing to offer the most compelling views of the city. Located on the highest floor of the hotel, each room follows the swooping lines of the Lutetia’s angles, arches and sculpted curves. The result is a memorable mix of slanted ceilings and sculptural window frames—classic features of the most prized Saint Germain rooftop homes and has a master bedroom and bathroom, separate living and dining rooms and a guest bathroom. In addition to these beautifully decorated rooms the Penthouse is crowned by a rooftop terrace, reached by a marble stairway and offering a panoramic 360-degree view of Paris. 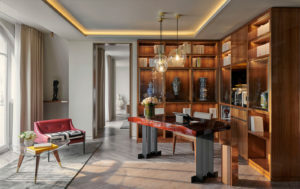 This 1,800-sq-ft. Presidential Suite is the largest suite at Lutetia and was designed in collaboration with the Carré Rive Gauche Association to reflect the hotel’s unique Left Bank location. 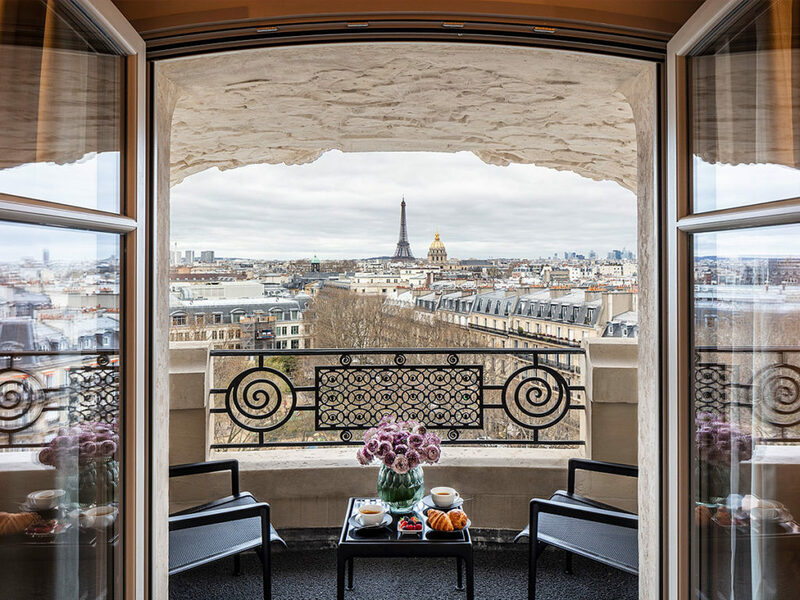 A collection of artworks curated by the esteemed organization as well as landmark pieces of contemporary furniture honor the artistic legacy of the Left Bank, while unrivalled views of the Eiffel Tower remind guests they are at the heart of the city. Located on the 6th floor, this suite is ideal for entertaining, as well as the most important private and personal moments. The spaces comprise an elegant and bright dining room for eight with picture-perfect Parisian views from its large French-windows, an adjoining kitchen and a spacious living room with multiple seating areas. Imagined as a Parisian salon brought into the 21st century, this large living space contains a library created by French publishers Gallimard and a magnificent Pierre Chareau mahogany desk. Further important contemporary furniture as well as antiques and artworks chosen from the 110 galleries that make up the Carré Rive Gauche ensure the suite feels both grand and welcoming. The bedroom offers a simply unforgettable setting to wake and repose with perfect Eiffel Tower views. This large area is completed by an oversized dressing room through which can be found an intimate private fitness room with exercise bike. A sublime bathroom is found beyond a passageway with a full-size marble goddess statue in the Grecian style, a final nod to the artistic passion with which this grand suite has been conceived.